Lewis Conway worked on the campaign to get a fair chance hiring ordinance passed in Austin. That "baby car" didn’t go unnoticed. “I spent 12 years of my life being denied job after job after job after job for no other reason than the worst day of my life,” he said. In March, KUT ran a story about how the City of Austin had not yet begun enforcing its two-year-old Fair Chance Hiring Ordinance. The law prohibits employers from checking an applicant’s criminal history until a job offer is on the table. The problem, in part, was that the city had not yet written administrative rules for how it would investigate complaints and penalize noncompliant companies. But without those rules, the city decided to dismiss two of the five complaints it had received by the end of February. (The city said it has received one additional complaint since KUT ran its first story). “Do we have to have the rules in place in order to create the transparency and process that ensures we’re doing due diligence?” asked Joya Hayes, director of the city's Human Resources Department, which oversees the Fair Housing and Equal Employment division. The answer, she said, is no. Conway, who worked on the campaign to get the first fair chance hiring law passed in Texas, said these dismissals do raise questions about transparency. “What protocol was used to determine the investigative process had been completed and what protocol was followed to determine that these companies were not, in fact, guilty?” he said. Austin's Fair Chance Hiring Ordinance went into effect in April 2016. The city received complaints against a moving company and an insurance company that August. According to documents obtained by KUT, however, the city did not tell the companies about the complaints until Feb. 15, 2018 – more than a year and a half later. Hayes said her staff and the City Attorney’s Office decided in February that they would go back and tackle complaints filed shortly after the ordinance took effect. Since the law established a one-year grace period during which companies would not be subject to fines, staff decided to investigate and close the more cut-and-dry cases. “In both of these cases, we had the opportunity to evaluate what the issues were without penalty and it was easy for us to determine whether or not we had the opportunity and the evidence necessary to dismiss the cases,” Hayes said. When asked if two weeks between informing an employer about a complaint and closing a case was enough time to complete an investigation, Hayes said, in these cases yes. “The investigation period in which we provide is on a case-by-case basis. So certainly, there are going to be cases in which we have the ability to look at it and do due diligence to the process in a shorter period of time,” she said. KUT initially asked for public information about the ordinance on Feb. 1. Hayes acknowledged that the inquiry, in part, sparked the city’s communication with the companies Feb. 15. “I think you were certainly a contribution,” she said. In the case against the moving company, a complainant alleged it had asked applicants whether they had a criminal background on the initial job application. Hayes said city staff looked at the company’s current online job application, which does not include a question about criminal background, and dismissed the case. The complainant had asked to remain anonymous, so the city could not ask that person for evidence. A representative from the moving company emailed a copy of the Craigslist posting the city had found on its own – but not until March 6, four days after the complaint had been dismissed. While the cover letter of the investigation acknowledged that the company had violated the ordinance, the company had come into compliance since the complaint had been filed. Council Member Greg Casar said the delay in investigating these complaints is worrisome, regardless of whether the city has a finalized process in place. “How can we expect that there’s going to be a good investigative process that’s going to have fresh witness information?” said Casar. (KUT reached out to all eight council members who voted for the fair chance hiring ordinance, but only Casar was available to comment before deadline). “They filed the complaint in 2016. ... We’re getting information from the employer in 2018. It just seems flawed from the start,” he said. Casar also questioned part of the city’s outreach attempts. 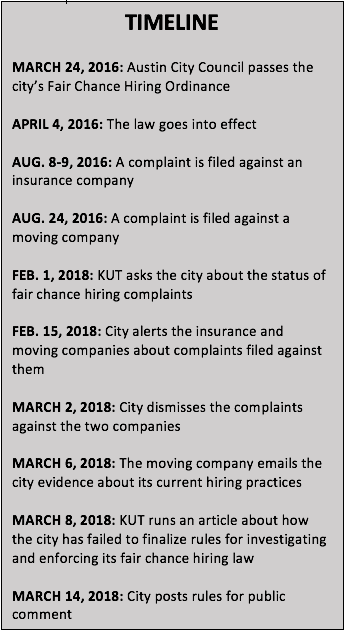 In March, Hayes defended the number of complaints the city had received compared to other cities by implying Austin employers were well-educated about the ordinance and therefore knew not to violate it. But according to attendance logs obtained by KUT, only 11 people total attended 10 in-person public information sessions on the ordinance. (The city did not keep a log for two online information sessions it hosted.) Hayes said the city had other, more successful, parts of its education campaign, including online ads. The rules governing how the city will investigate complaints and penalize companies in violation of its fair chance hiring law are now in draft form and open for public comment. The rules propose setting timelines for investigations, including letting no more than 10 business days pass between assigning an investigator to a complaint and reaching out to a complainant. (In the case dismissed against the insurance company, a written conversation between the city and the complainant didn’t begin until May 2017, nearly 10 months after the complaint was filed). The rules also lay out fines. A company with fewer than 50 employees found violating the ordinance will be fined $50, with larger companies subject to a fine of $100 for a first-time violation. The public has until May 4 to comment on the new rules.